Antoine Griezmann thinks France have to imagine Sunday's World Cup final is "just a normal game" if they are to hold their nerve against Croatia in Moscow. 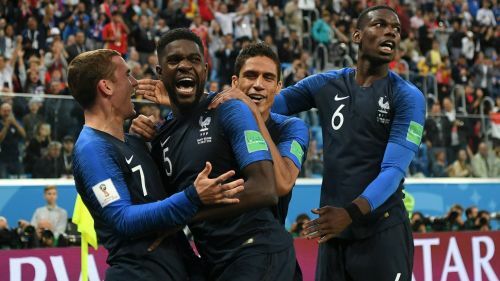 Didier Deschamps took his side to a second major final in consecutive tournaments with a 1-0 win over Belgium in the last four, in which Samuel Umtiti's header was the difference. Beaten on home soil by Portugal in the Euro 2016 showpiece, Les Bleus are hoping to go one better and get their hands on a trophy this time, just as their coach did in Paris 20 years ago. Griezmann says their preparations have been giving them confidence but admits their mental fortitude will be key to handling the pressure at the packed Luzhniki Stadium. "I feel good, we are confident," he told FIFA TV. "We are now getting into the tactical and video analysis phase of preparation, but we don't want to put ourselves under too much pressure. "We have to imagine it's just a normal game and give everything on the pitch. We won't have a lot of opportunities, so we'll have to put them away when they come." First-time finalists Croatia came from behind to beat England 2-1 after extra time in the semi-final, marking the third match in a row in which they have fought back from a goal down to win following 120 minutes. Captain Luka Modric has been hailed as one of the stars of these finals and has experience of winning the biggest games at club level, having lifted the Champions League trophy with Real Madrid in each of the last three seasons. Modric admits France will be their toughest test of all but has vowed there will be no let-up when it comes to Croatia's determination to win. "I think they deserved to be in the final and it's the toughest match," he said. "They're a great team, they're in the final of a big competition for the second time in a row. They're strong. But we're ready. "We'll leave our heart out on the pitch, just as we did in the previous six games." Kylian Mbappe might have grabbed most of the headlines for France in Russia, but Griezmann is the go-to star when it comes to their biggest games. He has scored or assisted 11 goals in nine matches in the knockout rounds of major tournaments for his country, which is more than any other France player for the last 50 years. Modric makes Croatia tick, but Rakitic makes that possible. His positional awareness is essential in allowing his team-mate enough time on the ball to dictate play. Rakitic has also produced star performances at club level when winning the Europa League and Champions League finals, so there are few more capable big-game players. - The last three World Cup finals have all gone to extra-time. However, historically, only two of the showpiece games have ever been decided on penalties (1994, 2006). - France have reached their third World Cup final, winning one (1998) and losing the other on penalties (2006). Their three appearances in finals since 1998 is also more than any other team over the last 20 years, ahead of Brazil and Germany (2). - Croatia have reached their first World Cup final, becoming the 13th different nation and 10th European country to do so. The last two first-time finalists have both won the tournament (France in 1998 and Spain in 2010), while the last to lose were the Netherlands in 1974. - Mbappe will be looking to become only the second teenager to score in a World Cup final after Pele, in 1958. Mbappe (three goals) is already the highest scoring teenager in a World Cup tournament since Pele (six in 1958). - Olivier Giroud has yet to have a single shot on target at this World Cup despite playing 465 minutes for France. Since 1966, no player has had more attempts (13) in a single tournament without getting one on target. - Ivan Perisic has been involved in 10 goals at major tournaments for Croatia (six goals, four assists), the joint-most along with Davor Suker (nine goals, one assist).